By Fr. Mike Snyder, M.M. Gibber jabbering in many tongues! Singing – in so many harmonious parts even the twigs can’t count them! As the Apostles boldly went forth proclaiming the saving message of Jesus so too have generations of men and women who have followed in their footsteps. They have been like twigs filled with the fire, the passion for God’s Mission as lived in the Paschal Mystery that is Jesus. For the past 107 years Maryknollers have been among those twigs generating sparks that have ignited others and others and others. We continue to go forth and invite you to join us for the short term as volunteers, the long term as lay missioners, and the life term as Priests, Brothers, and Sisters. 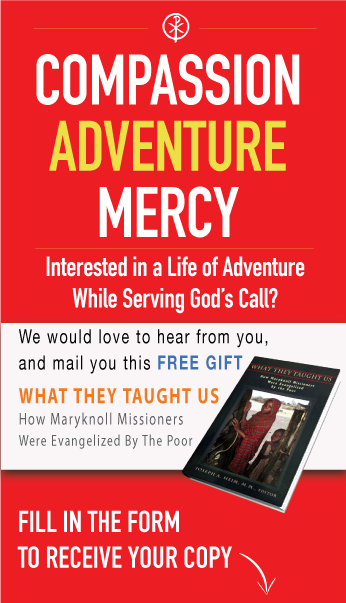 We welcome you to Maryknoll!